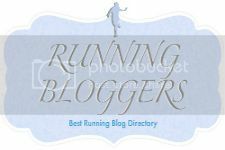 Two blog posts ago, I was asking myself : Am I Ready to Run? I wouldn't have been asking that question if I didn't have hypertension and is in fact under medication. But I said to myself, I wouldn't pass up opportunities like this one just because of that condition. I refuse to be held captive of high blood pressure, although I need to be wary of signs of fatigue or whatsoever. I am thankful for those who encouraged me through the comments, that I can in fact do this. 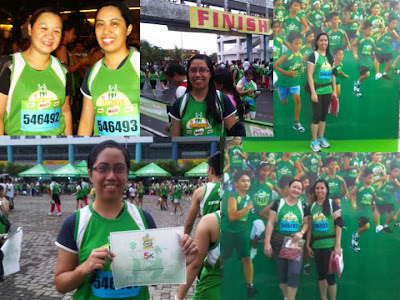 And so, last Sunday, the 29th of July, I was there at the Mall of Asia with thousands of runners, ready to pound the pavements and beat their personal records. I haven't got a personal record to beat, except to prove to myself that I can still run...for health. Minutes before the official gun time for the 3 and 5 K runs, this is what's right in front of me, a sea of green shirts (okay never mind the guy in blue). Seeing the starting line made me smile and all excited, specially since the crowd is already cheering, bobbing their heads, jumping even to see what's happening up ahead. When we heard the gunshot, the cheering grew louder and people started, well, walking. 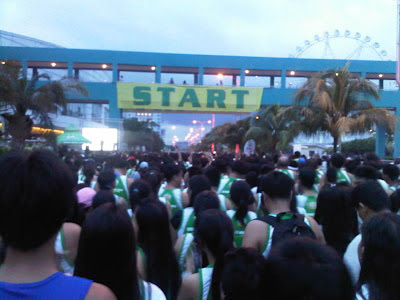 There's such a huge crowd that it was impossible to run a few meters after the starting line. The brisk walking seems like a good thing anyway as it sets the rhythm. A while later, my companions and I were already running, at least for about 5 minutes straight before we stopped and walked again lol! Hey, we're just priming up here so, a little short break and then off to running again. When I saw the 1 K mark, I was already panting. My legs and feet were still up for the run. In fact, I could have kept running all the way if it were just a matter of leg and feet endurance. Practicing Tai ji made my legs stronger. But as this is a rather intense cardio exercise (at least for a beginner runner like me), I got to go easy on my heart and lungs. The good thing about this particular run is that I was able to endure better than when I was just practicing for the run. I guess the practicing and preparations paid off somehow. At the U-turn, I was like saying to myself: "Alright, I'm halfway through the route!" There's the realization there that I can actually finish this in less than an hour (1 hour is the maximum time for the 5K run). I was actually smiling as I passed the 3 K mark, meaning only 2 K more! At about 1.5 K to go, I took to brisk walking and was planning to get a go at running when I can already see the finish line up ahead. It was at that time that I kept taking deep breaths already, more frequently than at the start. I figured I need to preserve the remaining energy to cross the finish line. At the finish line, I am all smiles despite looking haggard, what with all that sweat! I even stepped with emphasis on the timing plate. I was giddy and excited as I reached out for my finisher's certificate. Whoooeeeeee!!!!! I did it! I did it! Prior to the run, I was having fears of having a heart attack which is not an unfounded fear by the way. There are marathoners who succumb to that, despite looking physically fit. Silly me, I reminded myself that this is a 5K fun run, not a marathon per se. So that appeased me somehow. Truth be told, that fear dissipated when I started running. I was right, I can do it. The only fear left at that time, is that I might make the wrong turn or get lost in the route. Hey don't laugh. For someone with a broken internal compass, I could pretty much get lost in an unfamiliar place hehehe. A good friend asked me before this race that wouldn't it be much better to just jog at your own leisure and you don't even have to pay for any registration, if it's only about health that you're after? Talk about dampening my spirits, but I kind of agree with that premise. But as I ran that Sunday morning before the sun has fully risen, I realize that the energy and excitement of that event pales in comparison to running by your lonesome self. Also, knowing that this run is for a good cause, it makes one feel better about it somehow. As we were riding home, we can still see the marathoners finishing their respective races (10, 21, and 42 K). They were already running before sunrise because we passed by them on the way to the venue. I have such new-founded deep respects for those marathoners who run in those categories. To me, that is some kind of dedication...all for the love of running. I wonder if I'll ever be able to run in any of those categories. But even if I just stick to fun runs, I don't mind, so long as we don't take the fun out of running and that I can finish the race. 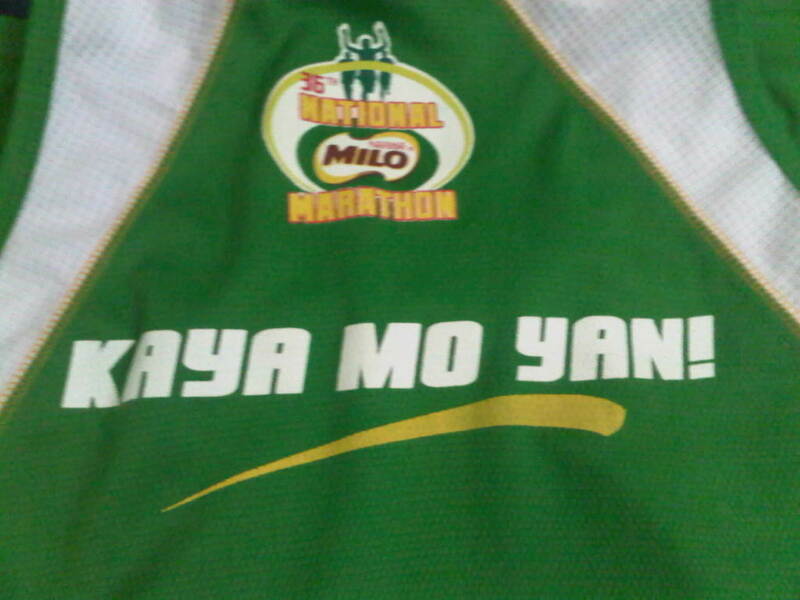 This is what you'll see at the runners in front of you, the backside of the singlet. Isn't it a good motivation and reminder? I think so! I think I finished the race in less than the allotted time. I'm still waiting for the official time though. I'll just check the race results HERE and will update this post. Meanwhile, we're already looking for a running event to be held next month. Actually Aileen, I am inspired with this post especially your desire to run for health reason. This is also what I felt on my first run. Nice self motivation. BTW, I will share this post to my colleagues (Malaybalay Runners), to get them inspired also to continue running. :-). Hopefully that one day, you could join us here in Malaybalay City. We have a lot of fun runs here.:-). I have not joined this. maybe this December since it is not that raining anymore. Congrats! You're an inspiration to all :). I wish I could do a 5k too. The most I've done was a 3k. I'm proud of you Aileen! Pat yourself for a job well done. You'll probably run faster than I do now. That's a good message "Kaya Mo Yan!" - I wish someday I can engage with such activities. Congrats on our first run. Sis, I'm more of a sprint type person actually...I can do short bursts but marathon is a different thing...endurance first before speed hehehe...that's where I have to work on..Remember I outran that dog in the beach lol! Nice one Aileen! This is one of my frustrations, hehe. i haven't join any fun run yet...but i think it would be fun. the last time i did was way back in high school and i fainted after 20 minutes of run. hehe. Congrats!!! When I first joined Fun Runs I only went 3k and I thought I was going to die lol. I miss running again but I need to prep myself... Congrats again. I wish I can finish 5k marathon din! Congrats, that a real feat! 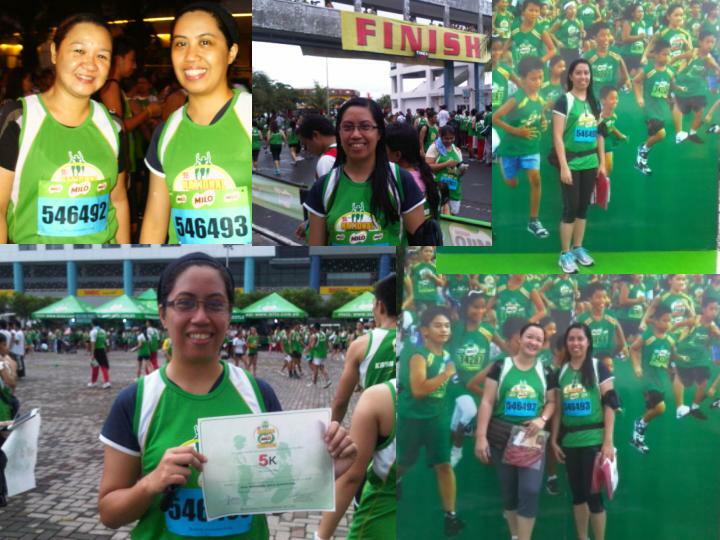 My friend joins fun runs din, she said it's much more fun cause you're part of something bigger than your own goals. You're right there about being a part of something bigger. Come on sis, let's get those running shoes pounding. :-) I really thought I wouldn't make it. Turns out my heart is still ready to take the challenge. Right, preparation is essential. I had a shorter time to prepare but better than no preparation at all. I can only jog in my own pace due to my heart disease. I can't even jog 3 mins straight. Jog walk jog is the best I can do. Iba pa rin yung excitement when you're part of a crowd. That's why these things are so popular nowadays. Congrats, sis! But you look so young to have hypertensions. I was worried about my heart too, Jona. We have a family history. That is why I am trying to make lifestyle changes and not be resigned to the fact that later on I could also succumb to the same disease because it's in my genes. Aiming to be 120 yrs old lol! Awesome first 5K! I felt the rush as you related that you're halfway through the route till you got to the finish line! Yay for you! Someday I'd love to run too and join events like this. Running on your own is good too but joining events brings it to another level I think. So keep on running! Congrats on your 5k run. For sure, you gonna do it if time and schedule permits. Congratulations on finishing your 5K run.. i am sure you will be running your first marathon in a year or two. running is really healthy. A very good exercise specially for the heart. I used to run before but not now anymore. Hope can get back. woooow! inggit!!! nasa list ko talaga ang Milo Marathon na yan!!! mukang enjoyable ang activity na yan ah, good for your body pa! Nice one. I never had tried to run, even in our P.E class, because I am asthmatic. I only witnessed the event when I was one of the cordon for a said place. Good for you. Running is indeed one way to get healthy. Just run what you can run. Congratulations Aileen ! 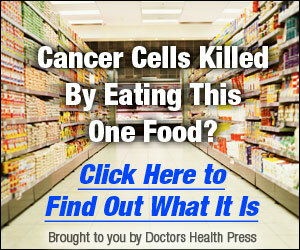 Just as long as your doctor gave you the go signal, it will be okay. Lately, I am into aerobics and Zumba. In fact we had a free session at Convergys last Saturday and it is also a great way to get fit. Hope we could see other in the future fun runs. a lot time I had spent for this info! Thank you! back later on and see if the problem still exists. Hi! Thank you so much for taking the time to visit this site. This is basically a blog about my personal journey towards better health as I try to hold hypertension at bay, or possibly reverse the condition. Towards the end of 2011, I started taking health and wellness more seriously, something I should have done decades ago. It's never too late to start and I know I have a long way to go. I hope you'll journey with me...better yet, run with me. It's one of the things I enjoy doing at the moment and you'll see a lot of my running escapades here. Busy at work! Work is now my exercise lol! No kidding. I walk around a lot. So there! iHeart Good Health © 2011-2015. All rights reserved. Simple theme. Powered by Blogger.